Wear your removable retainer as instructed by your doctor. 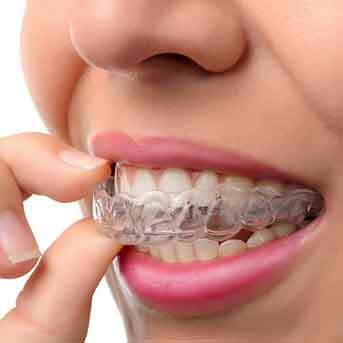 Invisalign trays should be worn 22 hours a day. Post braces retainers are initially worn 16 hours a day and after retainer check appointment are often worn only at night. Clean the retainer thoroughly once a day with a toothbrush and antibacterial soap. Use warm but not hot water. Brushing retainers removes the plaque, and eliminates odors. Efferdent® or other orthodontic appliance cleaners can be used but do not take the place of brushing. Bonded retainers help to hold your teeth in place for a lifetime-if it becomes loose, please call our office immediately. If it comes off completely, put it in your case and wear your removable retainer 24/7 except when eating or brushing until you can come to the office with the retainer to be repaired.